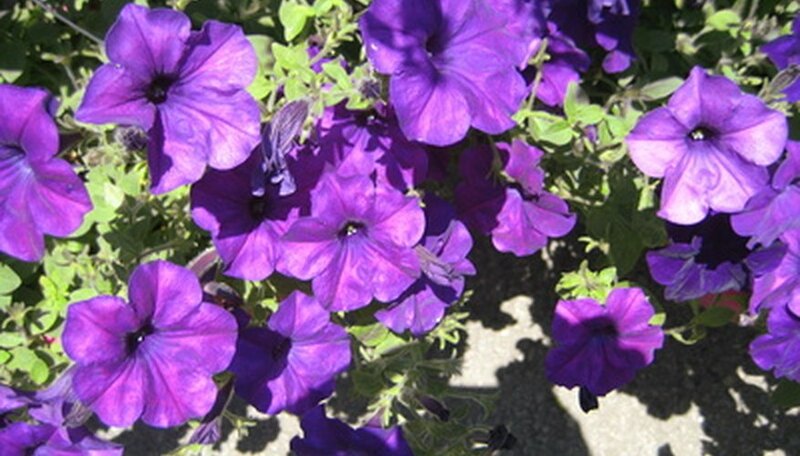 The same plant can come in many colors and those that have a purple variety offer shades from the palest violet to deep purple. Pick more than one shade and blend them in with gold or deep yellow flowers for a royal color scheme. Use your imagination with purple flowers to create the kind of garden you want. Heliotrope (Heliotropium arborescens) is a broadleaf evergreen native to Peru. Angelonia ( Angelonia angustifolia) is a member of the figwort family and native to Mexico and the West Indies. Lobelia (Lobelia erinus) is a native of South Africa that produces a profusion of flowers. Wild bergamot (Monarda fistulosa) is native to the United States, Canada and Mexico and a member of the mint family. Heliotrope grows from 1 to 6 feet tall with a similar spread. Angelonia reaches a height of 12 to 18 inches with a spread of about 12 inches. Lobelia measures 6 to 9 inches tall and 6 to 12 inches wide. Wild bergamot grows to a height of 2 to 4 feet with a spread of 2 to 3 feet. Sweet-smelling, violet-purple heliotrope flowers grow in large clusters from summer to fall. Oval, dark-green leaves measure 3 inches long. Angelonia features thin evergreen leaves from 2 to 3 inches long. Rose-lilac or violet-purple flowers measure 1 inch across and grow in thin clusters up to 8 inches long in the summer. Lobelia produces tube-shaped violet flowers with yellow or white accents grow in clusters and bloom from April to June. Wild bergamot produces tube-shaped, pink-lavender purple flowers from July through September in clusters at the top of the stems and will attract both bees and butterflies. The flowers are accented by aromatic, oblong, gray-green leaves that grow up to 4 inches long. Plant heliotrope in full sun or partial shade and a moist, rich well-drained soil. Plant angelonia in full sun. Let the soil go dry before watering. The plant will not take a wet soil. Plant lobelia in full sun or partial shade and a soil that is organic, moist and well-drained. Wild bergamot performs best in full sun nor partial shade. Give the plant a soil that is well drained. The plant is not fussy about the type of soil, but does need good air circulation. Heliotrope is grown as a perennial in USDA zones 10 and 11 and as an annual in other areas. Use angelonia as a perennial in zones 9 to 11 and as an annual in other areas. Lobelia is a perennial in zones 10 and 11 and an annual in the rest of the country. Wild bergamot grows as a perennial in zones 3 to 9.